I used a recipe from the Joy of Cooking and thought it odd that it called for 1 3/4 tablespoons of baking powder. I read it three times to make sure I had it right – and forged ahead. The pancakes turned out great but apparently it was an error in my version of the book. It should have been teaspoons, not tablespoons according to the Joy of Cooking website. 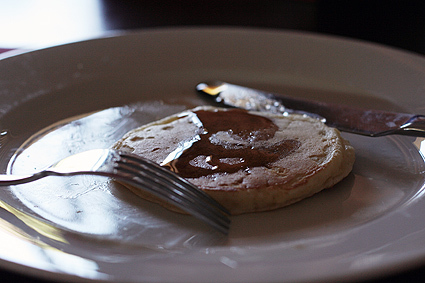 Here is the classic all-American pancake, the basis for seemingly endless variations. Mix the liquid ingredients quickly into the dry ingredients. Use 1⁄4 cup batter for each pancake. Thank you! I have the same version as you and love the basic pancake recipe, but couldn’t figure out why so much baking powder.